It's week 2 already of the White Shabby Chic challenge over at the Third Coast Creative Challenges Blog! Here's my 2nd creation on the theme and hopefully provide you with some inspiration! I encourage you all to give it a try and enter the challenge for a chance to win a $25 gift certificate to Third Coast Rubber Stamps! You do need to use at least one Third Coast rubber stamp to be eligible for the prize! 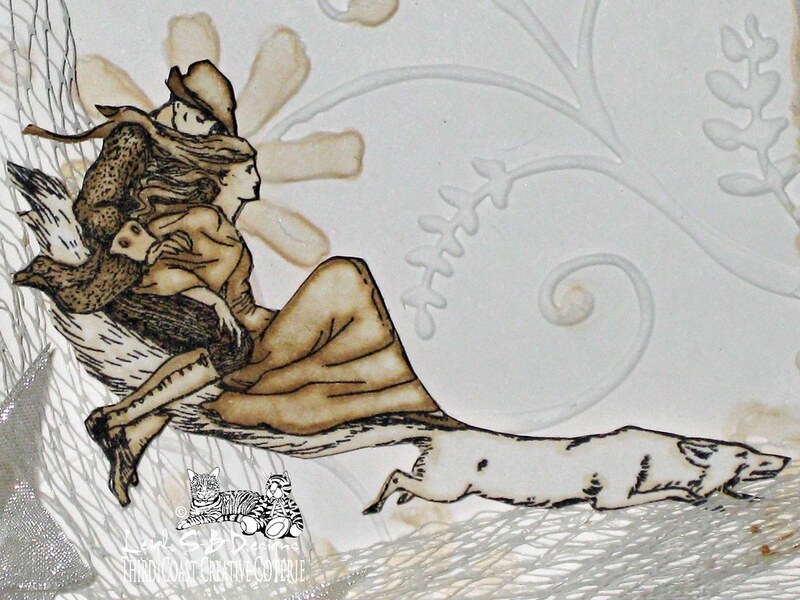 I used Third Coast's fantasy image called Fox Riders FT-218-J as the focal point of my white shabby chic project this week. The image was stamped with Tuxedo Black Memento ink on to a sheet of heavy weight Strathmore Bristol Smooth cardstock and fussy cut out with detail scissors. The image was coloured with Copic markers E41, 43 and 44 and blended with the Colourless Blender. I also removed colour with the Blender marker as well to achieve the vintage sepia tone effect. 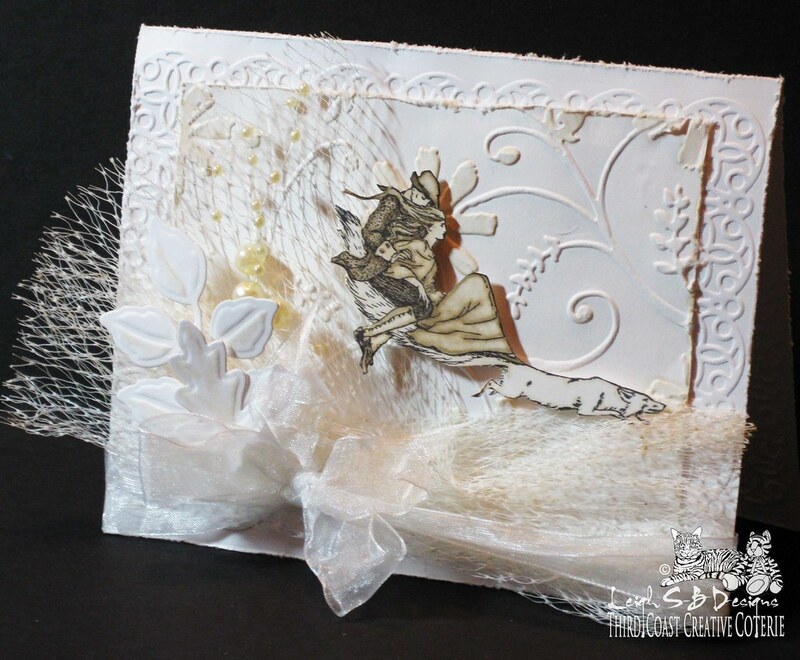 I used an ornate pattern 5 x 7 Cuttlebug embossing folder from their Paper Lace II set to emboss the entire folded white card and layered an embossed mat with Cuttlebug's Stylized Flowers on to it. Both the card and the mat edges were distressed with Tim's paper distresser tool to give the card the shabby feel. I also added touches of Copic E41 to the daisy flowers and along the edges on the mat and faded it out with the Colourless Blender to add to the vintage feel. 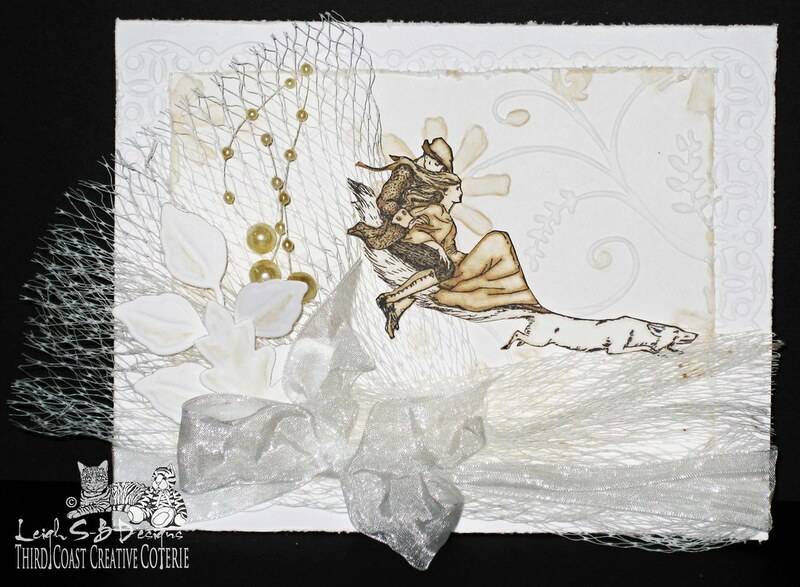 I embellished the card with a piece of white netting my onions came in many moons ago and a white organza ribbon which I tied in a bow and crinkled with a quick zap of my heat gun. I added two die cut Spellbinders leaves which I also treated with the Copics E41 and Colourless Blender and 3 sprigs of off-white pearls. The Fox Riders were adhered with pop dots for even more dimension. 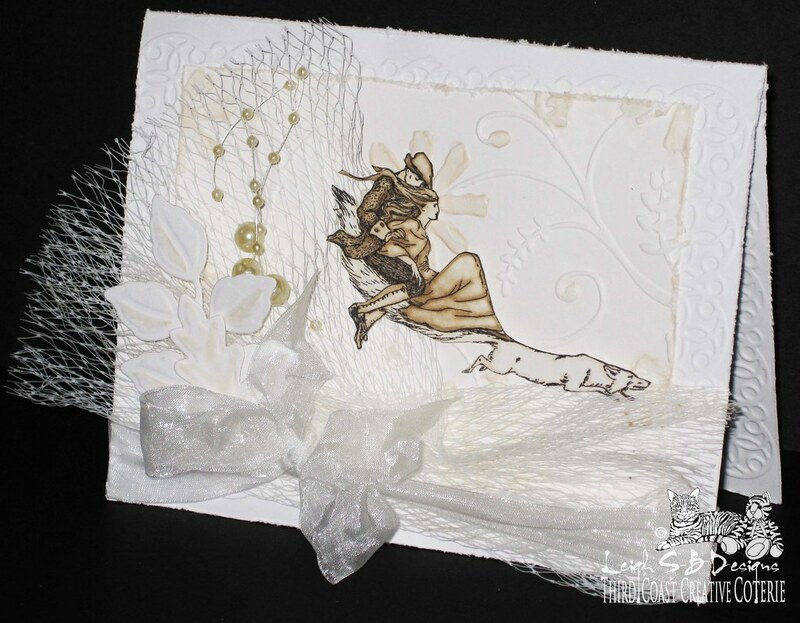 I love the wonderful play of shadows created by all the embossing and the varied layers which you can see in the photo above and adore the ethereal feeling of the finished piece! Absolutely stunning - I am a huge fan of Shabby Chic. Thanks so much for joining us at Tuesday Alchemy this week and we hope you will join us again. I love your blog and am now your newest follower. I am having a blog candy give away if you would like to join in. Thanx for sharing at Stampavie and More this time. Love your card...thanks for joining us at TTCRD this week. Thanks for joining us at Diva's this time. lEIGH: Your card is so cute--love the ALL WHITE! Isn't this a fun way to use your stash! Thanks for joining in our "Use Your Stash - Challenge #26" at Simply Create Too. gorgeous!!! love shabby chic in white! !